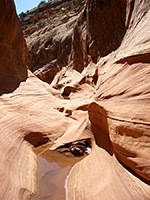 There are many easily accessed slot canyons along Hwy 95 either side of Hite at the northeast end of Lake Powell, including several tributaries of White Canyon and North Wash. Gravel is the longest branch of White Canyon, but nearby Long Canyon is also extensive, running for ten miles across a plateau of whitish Cedar Mesa sandstone, between distant dark red mesas of the Moenkopi Formation. 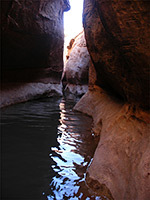 Like all other canyons in the area, Long has enclosed, moderately deep but relatively short sections of narrows between more open passages, containing frequent pools that retain water for some time after rainfall. A few of the slot parts may hold permanent water, requiring wading or swimming, while in the upper reaches of the canyon are several sheer drops of up to 40 feet where ropes are needed if descending. 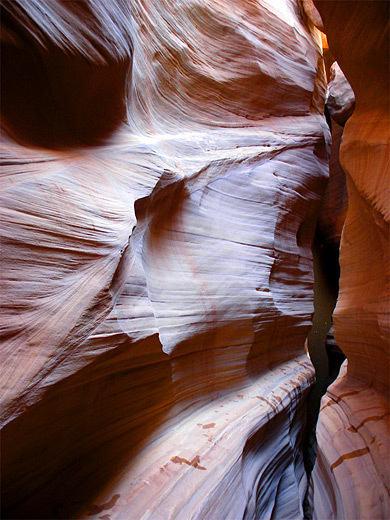 Around half a dozen side canyons also have narrows, so to explore the whole complex fully would take several days, though the lower few miles make a good day trip, encountering only minor obstacles. The hike passes beautiful scenery, a variety of eroded rock formations and different types of narrows. Topographic map of lower Long Canyon. 23 views of Long Canyon; gallery, slideshow. The upper end of Long Canyon may be approached via the unpaved Squaw Rock Road, the route used to access the Sundance Trail into Dark Canyon; 9.5 miles beyond the trailhead, the track curves round a major tributary (Lost Canyon), from where Long is reached by heading south up a short ravine, over a high but narrow ridge, then down the far side. The lower part (the hike described below) is much easier to get to, however, by parking alongside Hwy 95 somewhere between mileposts 63 and 64; one possible location is at Gravel Crossing, where a 4WD route crosses White Canyon at a point where its enclosing cliffs are low and not sheer. From here Long Canyon is a 2.6 mile walk downstream (northwards). Closer access is possible by parking beside the highway about a mile to the north, walking east a short distance to the rim then descending on the inside of a big bend in the canyon, down sandstone benches, a slickrock slope and finally a sandbank, to the canyon floor. Long Canyon is then just one mile north, round a few wide bends in White Canyon, here 120 feet deep and 400 feet across. At the White Canyon junction, Long Canyon is quite enclosed though it soon widens, as bushes and sand dunes reappear. 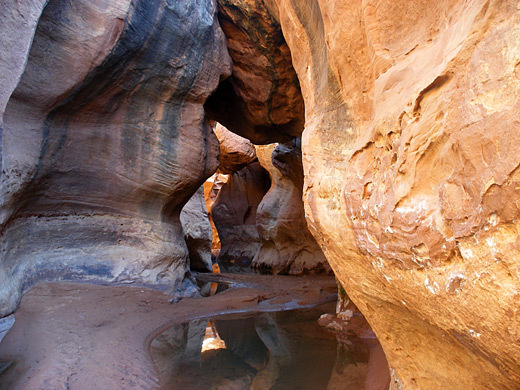 A few pools between boulders precede a narrow section beneath a pour-off, where a deeper pool persists all year, creating nice reflected light effects on the orange, overhanging sandstone walls. The pool is easily bypassed via a well worn path on the left side. 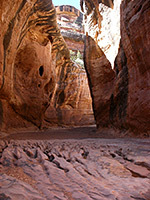 Above is a long, straight, flat-floored passage etched with small, twisting channels where flood waters have carved into the soft rock. The canyon enters a tight, n-shaped bend, in the middle of which is a smaller drop and another fluted terrace, followed by a u-bend as the drainage becomes temporarily quite wide, and the walls on the south side less steep. 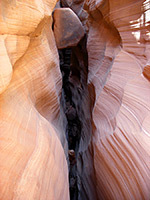 Soon after, a more slot-like part begins, moderately narrow, containing three features of note; a dryfall down a vertical chute, a deep overhang, and another pretty fluted section between vertical walls, beyond which the canyon opens out again and curves through two more wide bends, lined with bushes. The vegetation stops, replaced by a floor of bare rock, as Long Canyon gradually narrows, entering the first extended slot section, initially containing small boulders and shallow pools, then a much longer, deeper pool (swimming may be needed) that ends at a dryfall. Above here are more narrowish passages leading to the first significant tributary, on the north side. This has a sandy floor, a thin pool then a short but very pretty slot, just 2 feet across for most of its 500 foot length. The walls are formed of thin, angled, reddish strata, creating narrow ledges that assist when climbing up. The main canyon offers a few other routes up to the rim - one on the north side just before the main narrows, though most is sheer-sided. The distance to this first side canyon is 2.7 miles from the White-Long junction, so a good target for a half day hike; upstream are another 2.5 miles of short slots before the next big obstacle, a high, sloping dryfall - a point only half way through the canyon.